WEIGHT IS IT ALWAYS A TOUCHY SUBJECT? Well to address the first question, I don't think that anyone has the right to be attacked and not defend themselves. I do think that you can defend yourself without attacking others. To address the 2nd question, how I feel about my weight fluctuates. For the most part I'm not too sensitive because I surround myself with people who don't see it as a issue. But every now and again I can be hard on myself. I fear that my weight will be such an issue for men that I won't be a wife or a mother. People can compliment me all day, but not having that Love it what scares me. Here is my 2 cents on the situation: When you are in the public eye... i think you have to almost be ready for anything. Im not saying the the 1984 was correct in asking what she asked. Im just saying she is one of the typical fb/twitter/fan(or not anymore)/everday person. Its to be expected that people will ask all kind of crazy questions that make u say... "did she just really ask me that?" Im no where near famous (yet) and i still get asked crazy, left field questions... im sure some ofyou do too. I was more so disappointed in how JHUD handled herself... Im like girl u are too much of a woman to let someone like that pull u out of ur happy zone. I would have: 1. ignored the heffa 2. used that as an opportunity to promote weight watchers, and 3. kept it moving. For the second question/ statement: I too try to surround myself around people who dont see weight as an issue or who dont think that your weight equals your worth. Unfortunately when I step outside my door or enter in to "mainstream" society... that pressure is there. I just tell myself that Im beautiful no matter what. If you feel it on the inside it shows on the outside. Its hard tryin to live your life and be plus size. It does affect every aspect of your life. By me being gay and have dated men before.. sometimes its harder dating women then men and being the size I am. But I just know that the woman that ends up wit me will be the luckiest chick on earth if she can love me for me. But until then imma keep on pushing, striving for better health, and keeping my peace of mind. and just bc i want to share... u r talking to a chick that was a size 24 last year and who just got into a pair of 18 jeans last night... woot woot! cutequeer oh how I love your response. congrats on getting into that 18!!!!!!!!!!!!!!! what's next? Good job cutequeer, keep it up! To answer the question, I think that once you step into the spot light, you have to handle situations differently than if you were a regular-everyday person. 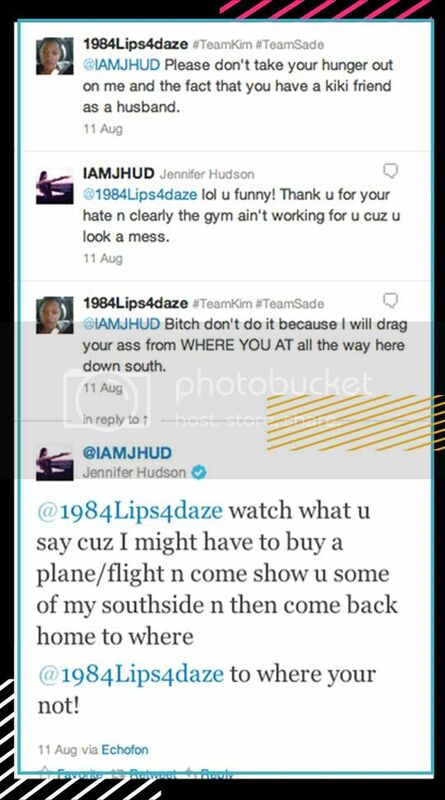 JHud, could've definitely handled that better by ignoring her or promoting weight watchers. Another thing that we have to understand is that just because she's a celebrity she is still human, she will make mistakes, what pisses some/most of us off and makes us snap will make her snap as well. So we can't judge them all the time on their reactions to situations and not realize that she's human and will do things out of character, her feelings still get hurt too. As for the second question, I am honestly pleased with my shape at a size 18, the only thing I want to do is lose a few pounds (25-40), as long as I can keep my shape. I don't ever want to go under a size 12-14. I feel where Shante is coming from as well, interacting with a few guys and listening to their views on women and weight, I sometimes get discouraged because I've heard a guy say that any man that dates a women that's is overweight is only doing so to have a free place to stay. I've heard a guy say, why does society celebrate overweight women with fashions shows, I've heard just about every rude thing that could have been said about overweight women that can be said (not directed towards me). As for the airplane thing, I have that fear for a few of my family members who are overweight and I'm trying my darnest to get them to drop some weight before July 2012, when we go on vacation in Montego Bay, Jamaica. And LoveMe, this post has inspired me to get back on my "get right" plan. Thank you for your kind words!